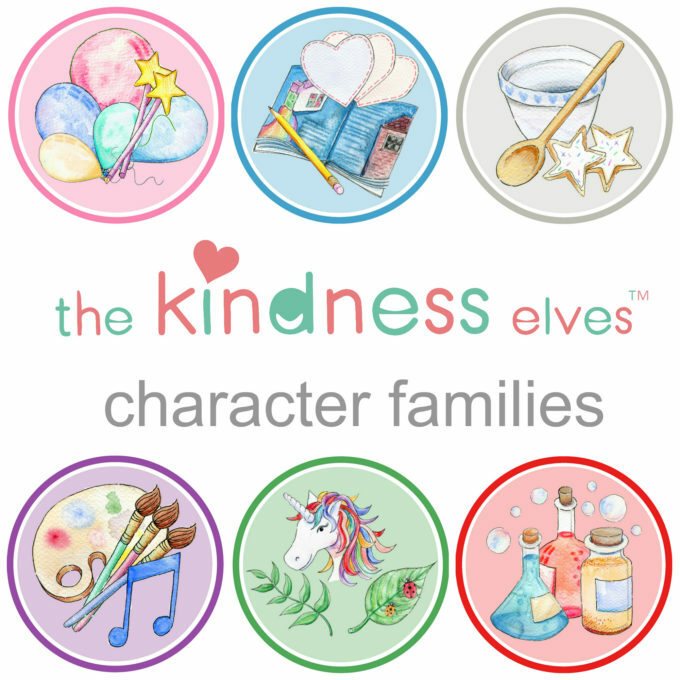 Meet the Kindness Elves Family character groups and find out their names, occupations and special interests! The Kindness Elves are the perfect way to inspire acts of kindness and develop empathy with young children, with that added touch of magic and fun! As you know, the Kindness Elves are my very special project to which I’ve devoted much time and love over the past few years. 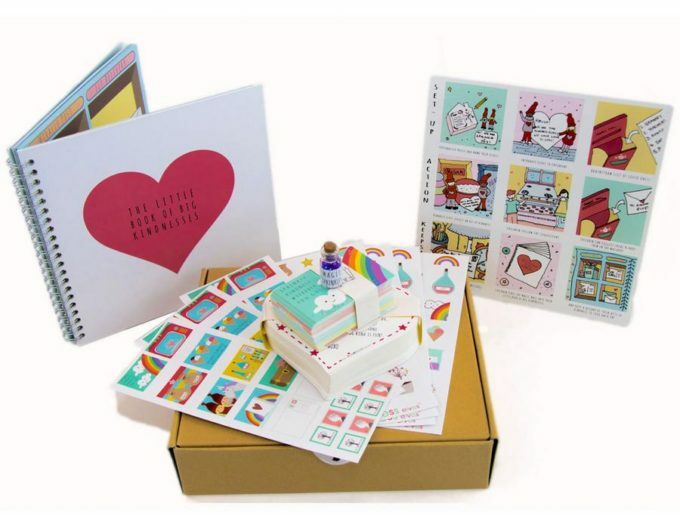 They now have their own website and there is a whole range of supporting products from a story book to a gorgeous accessories kit, all beautifully produced to support the use of the Kindness Elves at home or in the classroom! 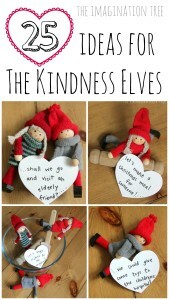 You can read our very first post about the Kindness Elves here on this site, which has now reached millions of people worldwide! 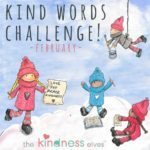 For those who have followed along since the beginning, we thought it was about time that we introduced the Kindness Elves family groups! 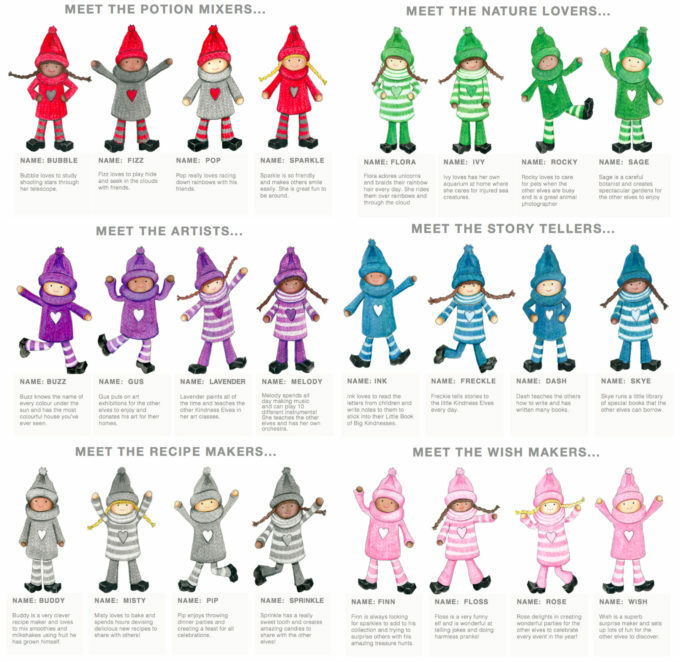 Each of our 6 colour sets of Kindness Elves represents a different responsibility, hobby and occupation and these groups work cooperatively to keep the Kindness Elves world running smoothly in perfect harmony. You can also find out each of their names and special interests too, which will be so fun for your kids read about! Our blue Kindness Elves are the Storytellers and they love to read, write and talk! They’re responsible for writing out the Acts of Kindness cards and also for the Story of the Kindness Elves book too. Some love poetry, others love telling stories to children. They all love to write letters and check the mail box daily! The boys are named Ink and Dash. Ink loves to read letters and write notes. He is in charge of writing the mini postcards for sticking into the Little Book of Big Kindnesses, although all elves can contribute to this too. Dash is a teacher and shows the little Kindness Elves how to write. 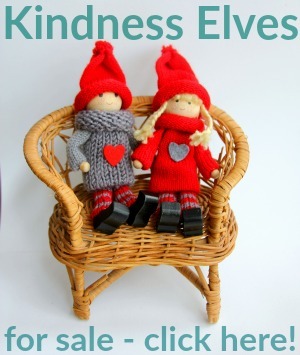 He himself is an author and writes many of the books in the Kindness Elves library. The girls are named Freckle and Skye. 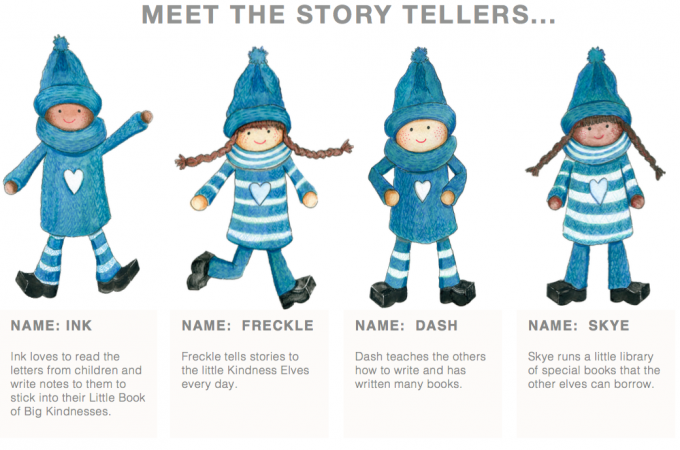 Freckle tells stories to the little Kindness Elves and Skye runs the library! 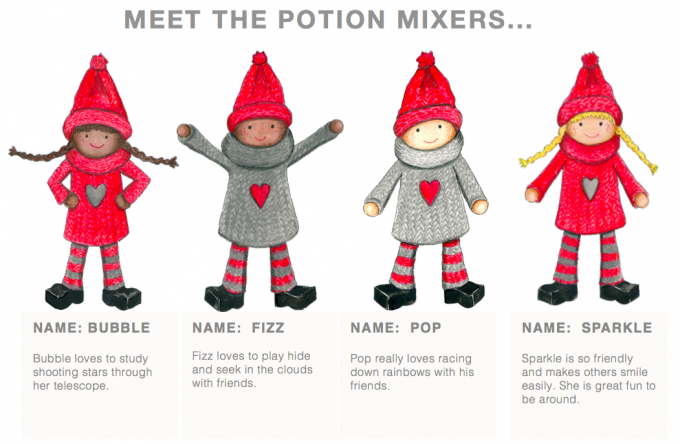 Our red and grey Kindness Elves are the Potion Mixers who love to create and experiment, stirring up bubbly pots of kindness concoctions all day long! They pour happiness into raindrops and paint rainbows in a dazzling array of colours! They are particularly good at thinking of acts of kindness to show to others and are scientific thinkers in all that they do. The boys are called Fizz and Pop and they’re so very playful! The girls are named Bubble and Sparkle and love to make others laugh and smile through acts of kindness and thoughtfulness. They’re star-gazers too! Our green Kindness Elves are the Nature Lovers who love to be outside playing and exploring at all times! They are tree climbers, forest explorers, beach diggers, wave jumpers, leaf throwers and puddle splashers! They care for the environment and all animals, both wild and pets at home. They take a special interest in the plants and flowers, cultivating their own beautiful gardens to bring happiness to others! Flora and Ivy take care of animals and sea creatures, and Flora is known as the Unicorn Whisperer because she loves and cares for them so well! Ivy takes care of poorly animals and is very knowledgeable. 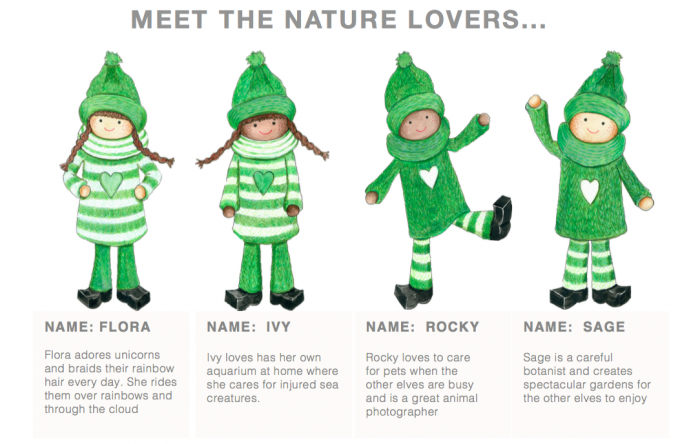 Rocky has a special interest in pets and even takes their photographs while Sage has a special interest in growing and cultivating plants in the Kindness Elves gardens. 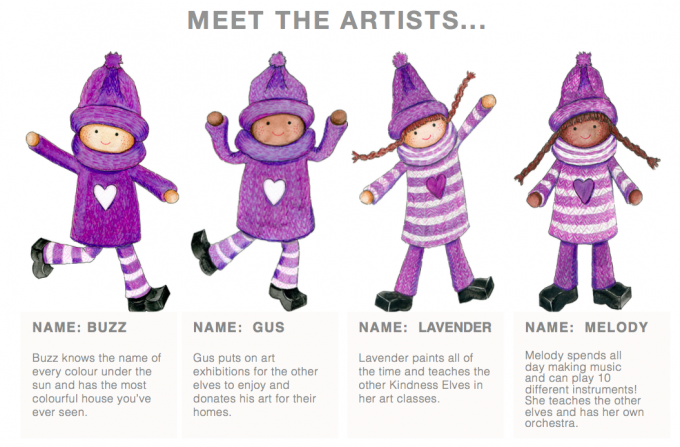 Our purple Kindness Elves are the Artists who love both art and music and are creative in their thinking and actions. Some love to paint, draw and make models while others prefer to play musical instruments, sing and dance! They put on wonderful shows for others and spread kindness in creative ways. Buzz loves colours and knows the name of every single hue, many of which he has invented himself! Gus is a curator who puts together wonderful art exhibitions, as well as donating his own for good causes. Lavender is a painter and also a wonderful art teacher. Melody lives for music and can play 10 different instruments, as well as organising a little orchestra too! 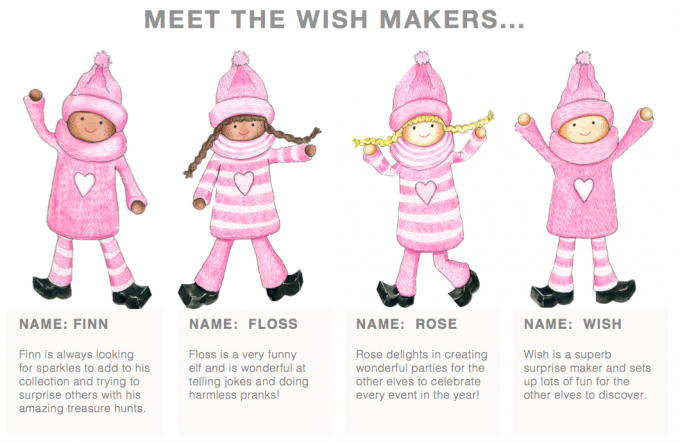 Our pink Kindness Elves are the Wish Makers who are fabulously inventive and love nothing more than to create wonderful surprises for others to enjoy! They decorate places beautifully, wrap gifts and set up amazing treasure hunts for little ones to enjoy. If there’s a celebration happening the Wish Makers will be in the middle of it, probably covered in glitter and confetti! They love to make wishes come true in whatever way they can. 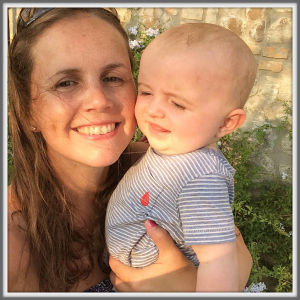 Finn is known for setting up amazingly fun treasure hunts and Wish creates fabulous surprises! Floss is a comedian who loves to tell jokes and play fun tricks. Rose is the party planner of the Kindness Elves world and is the organiser at all main events. The little elves really love the Wish Makers! 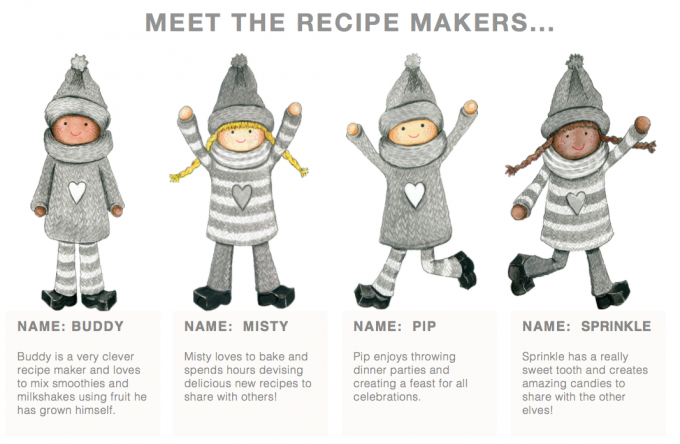 Our grey Kindness Elves are the Recipe Makers who are the cooks and kitchen inventors of the kindness Elves world. Their skills and talents are a really important part of caring for others. They enjoy trying out new recipes, cooking up a storm and providing meals and treats for others. They bake amazing cookies and cakes and mix the best fruit smoothies you’ve ever tasted! Misty is a baker and spends many hours working on new cake and cookie recipes to share with others. Buddy grows his own fruits and turns them into healthy smoothies and delicious milkshake treats! Pip is a master at throwing dinner party celebrations and cooking up a feast for all occasions. Sprinkle is very popular with the little elves because she makes amazing sweets and candies which she hands out generously! Together the Kindness Elves family character groups create a beautiful world where everyone works together in harmony for the good of others. They depend on each other and are constantly teaching and helping one another by using their special talents. Each character group can help to teach kids how to care for the world around them, use their skills to help others and work together as a team! 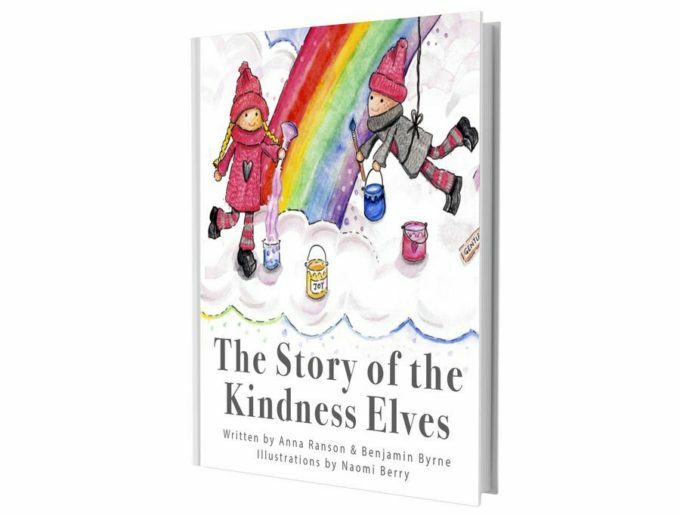 If you’d love to use the Kindness Elves with YOUR children at home then you’d probably love to start with our book The Story of the Kindness Elves which tells the whole story of their land in the rainbows and clouds! 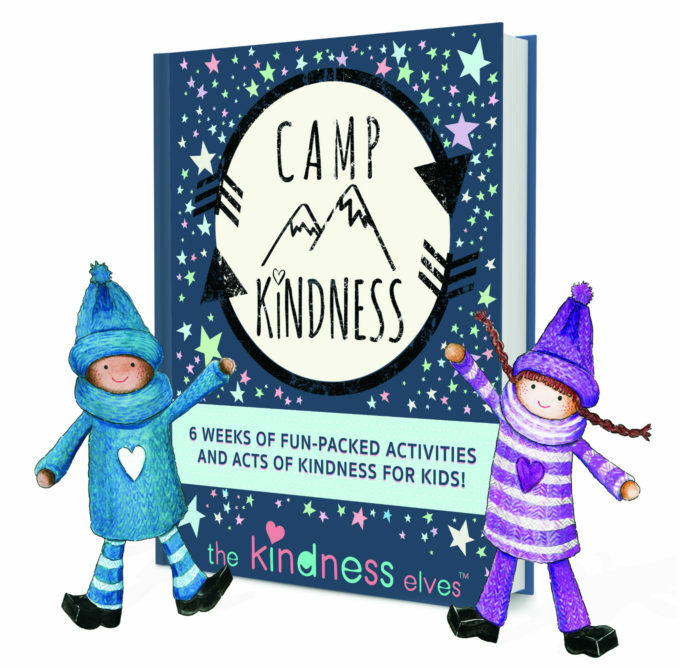 We also have a every colour set of Kindness Elves to choose from, an accessories kit, Kind Classroom teaching eBook resource and planning materials and a BRAND NEW summer activity camp eMaterials Book called Camp Kindness! 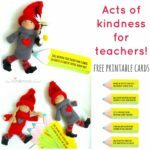 Invite the magic of the Kindness Elves into your home or classroom today!